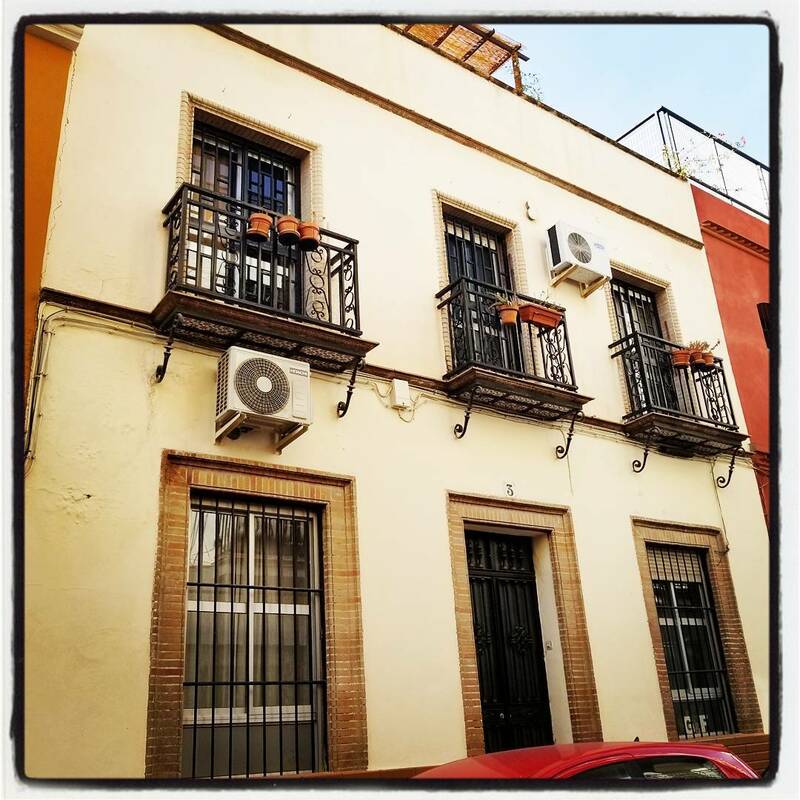 Our Airbnb apartment is in an area of Seville known as La Macarena. 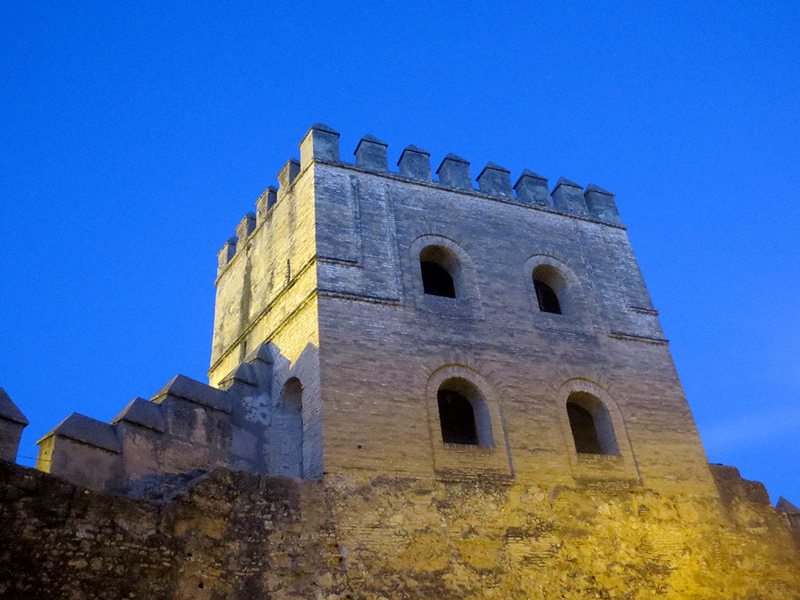 The neighbourhood is most famed for its Basílica de la Macarena and a long stretch of the original murallas, or protective city walls that date to Roman times. When we take the garbage and recycling out, the nearest designated city bins are at the base of those walls. It’s slightly more scenic than the garbage area in the parking garage of our condo back home. 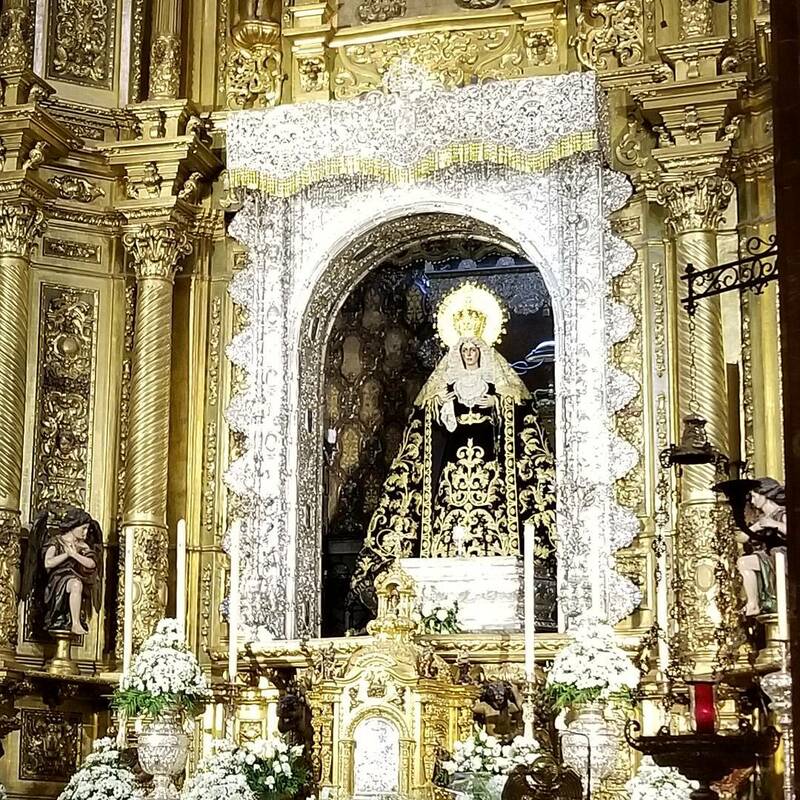 Just down the street, the Basílica houses a famous sculpture of the Virgin of Hope of Macarena, an elaborate icon that is carried through the streets of Seville during the Santa Semana (Holy Week) festival every spring. 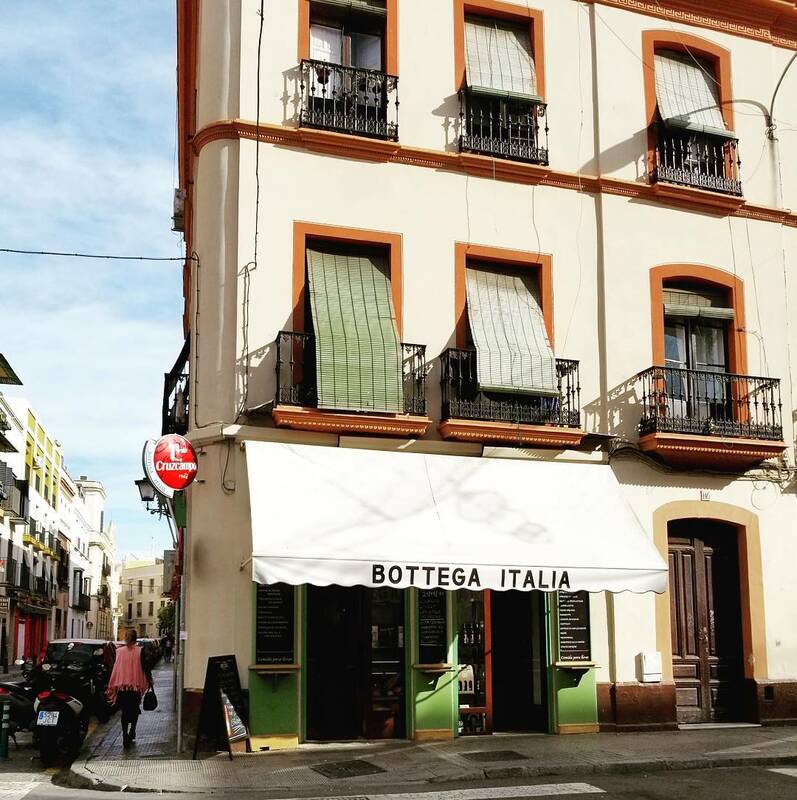 La Macarena is a little north of the city centre, and the number of tourists is fewer, giving us a better feel for local life in the city. 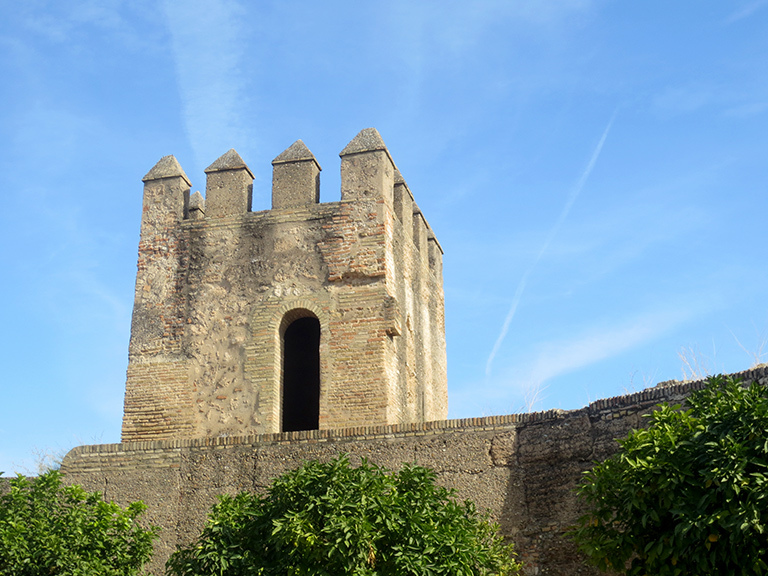 But when we do want to see the sites it is only a short walk down to attractions like the Setas, the Cathedral, and the Alcazar. 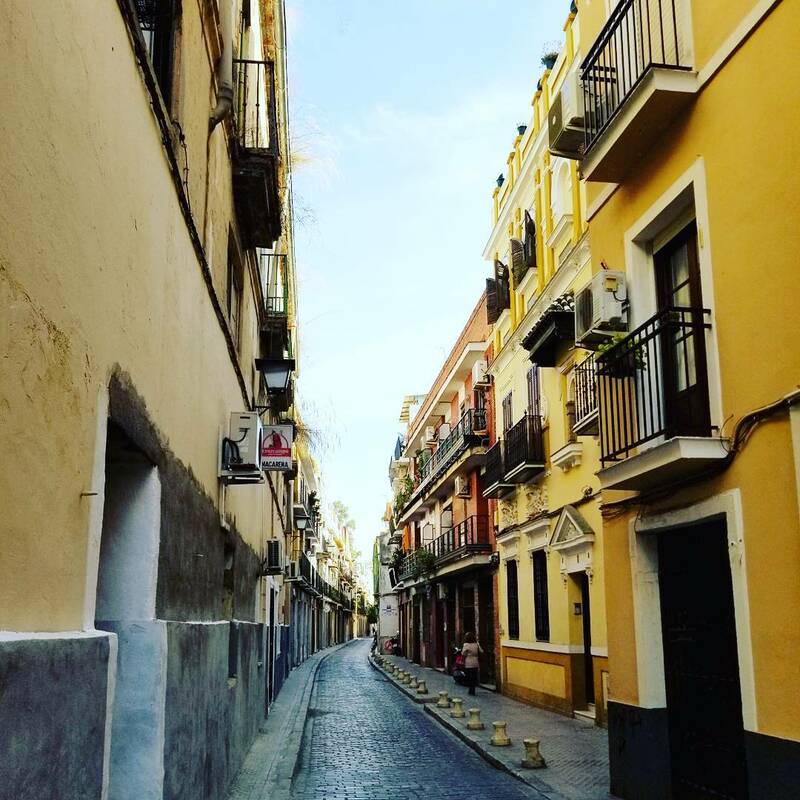 The entire historic part of Seville is flat and walkable and there is no need for us to use public transit. 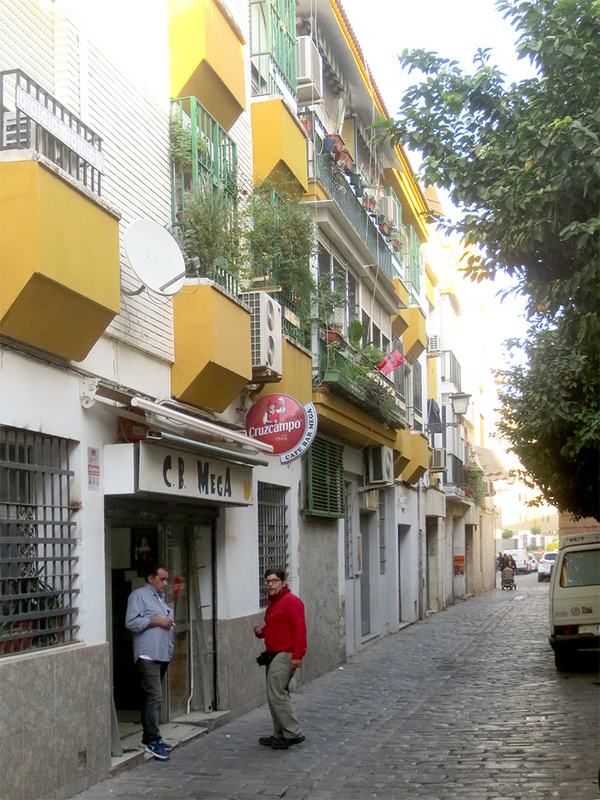 Scooters, however, are a common way to get around Seville, and they are well-suited to the narrow streets. Unfortunately they’re also loud as heck and spew choking exhaust, which isn’t ideal for everyone else in the vicinity. Our Airbnb apartment is on the ground level of a small building constructed in 1940. The owners live upstairs, but there’s a private entry vestibule with separate doors leading into the various apartments. 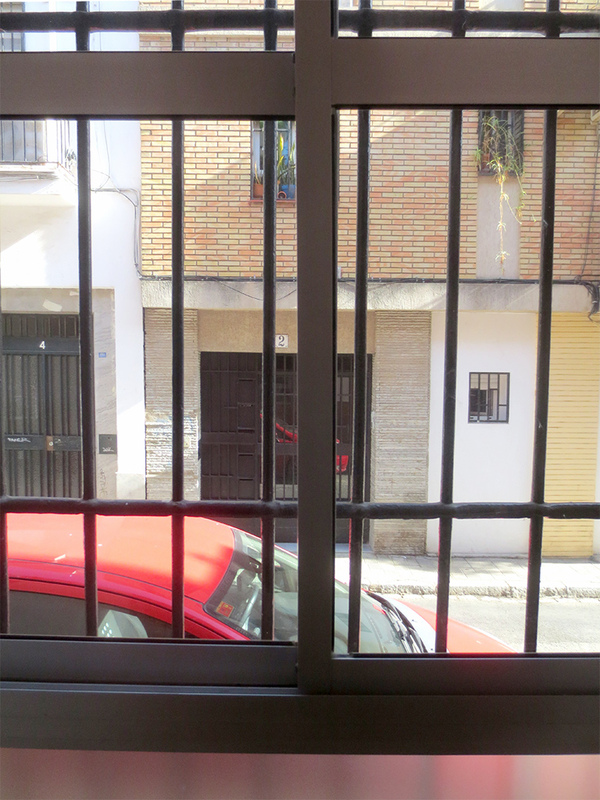 Because the streets are narrow, the road is only a few feet from our window. 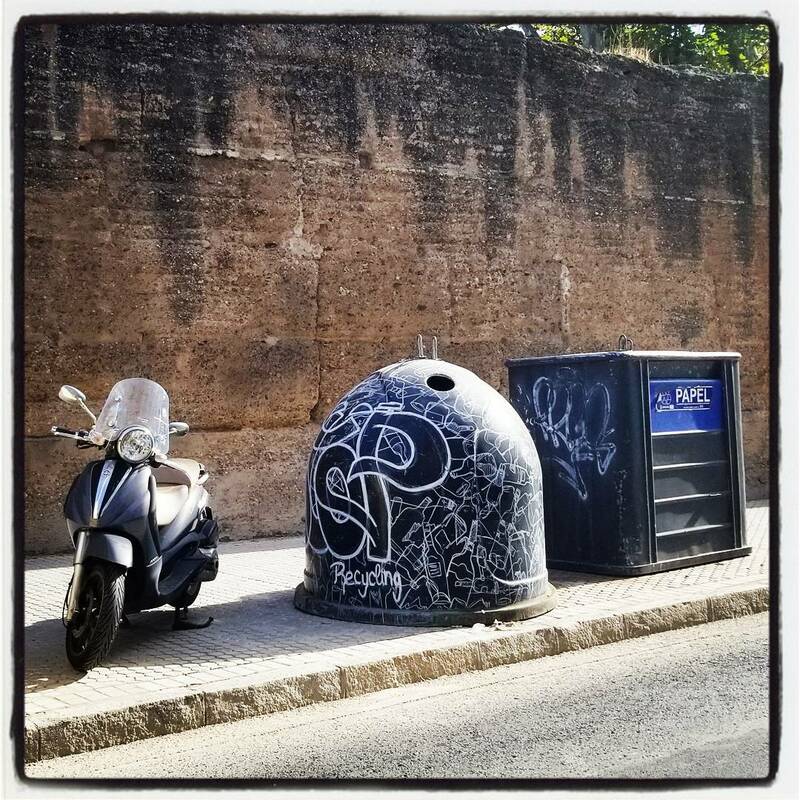 Luckily there’s only a bit of traffic noise, mainly scooters. There is a handy metal shutter that we can roll down at night. 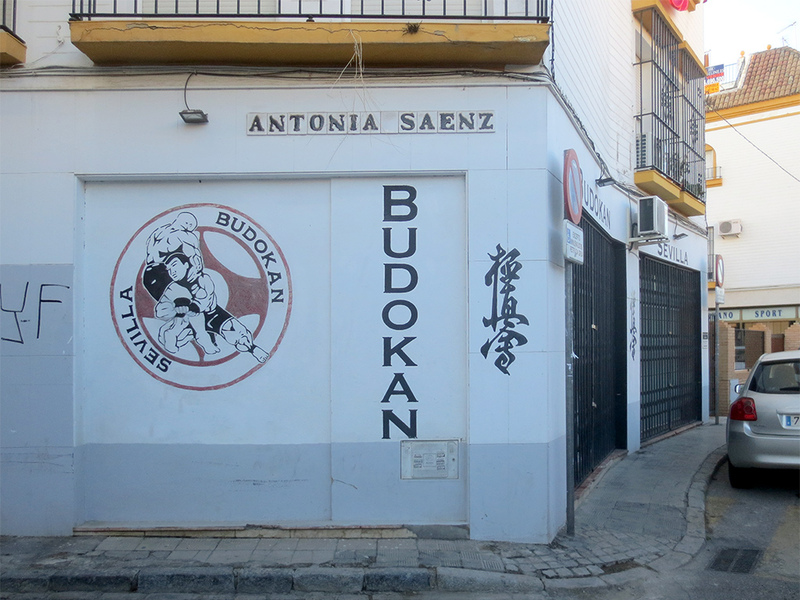 Just up the street is Bodukan Sevilla, a martial arts studio. 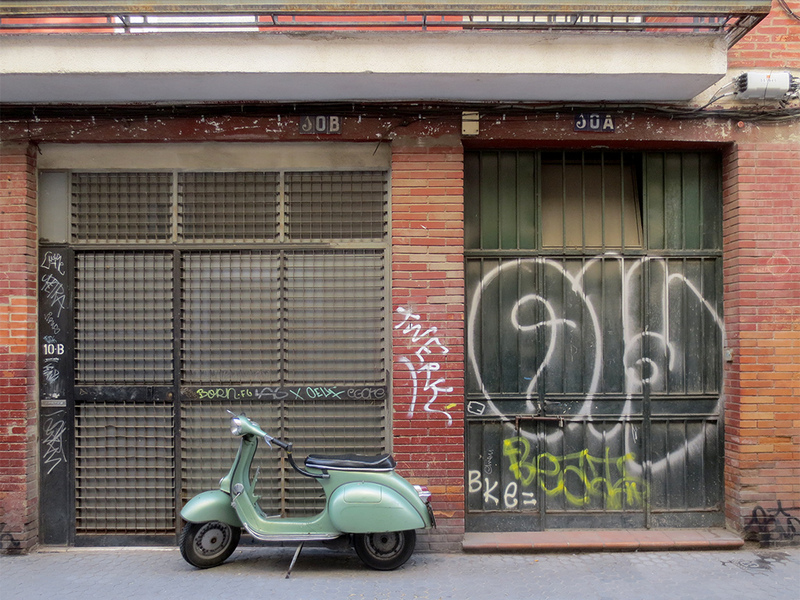 La Macerena is known as a creative and artistic area, and there are a number of little workshops around. 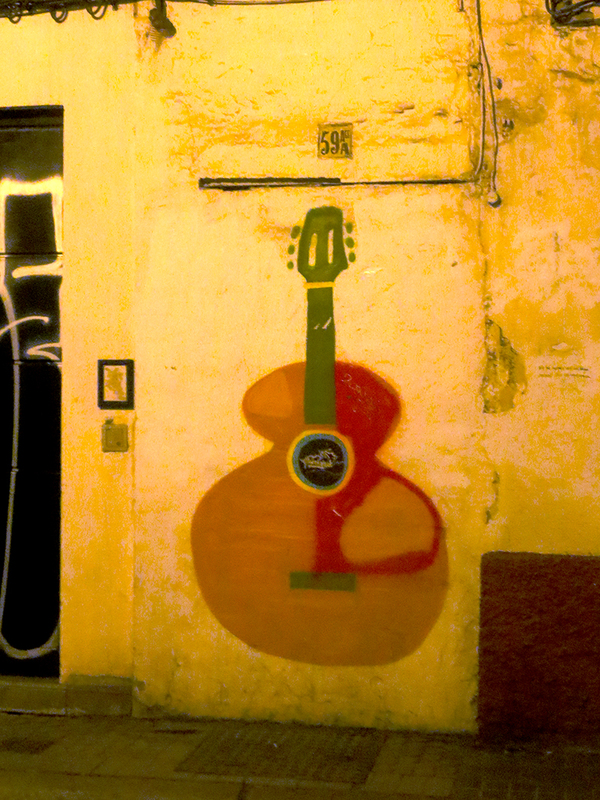 We catch glimpses through doorways of luthiers making musical instruments, artists painting, and dancers practicing Flamenco moves (with the requisite thumping of feet). 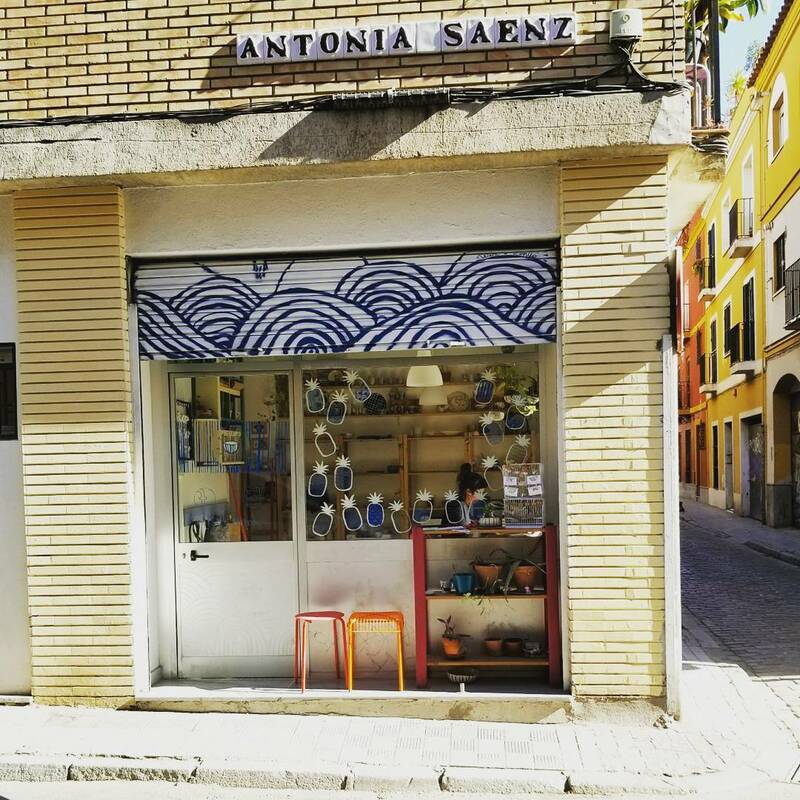 Just a few doors down from our apartment is a small pottery studio staffed by young women. Some of the businesses in the area look like they’ve been there forever. 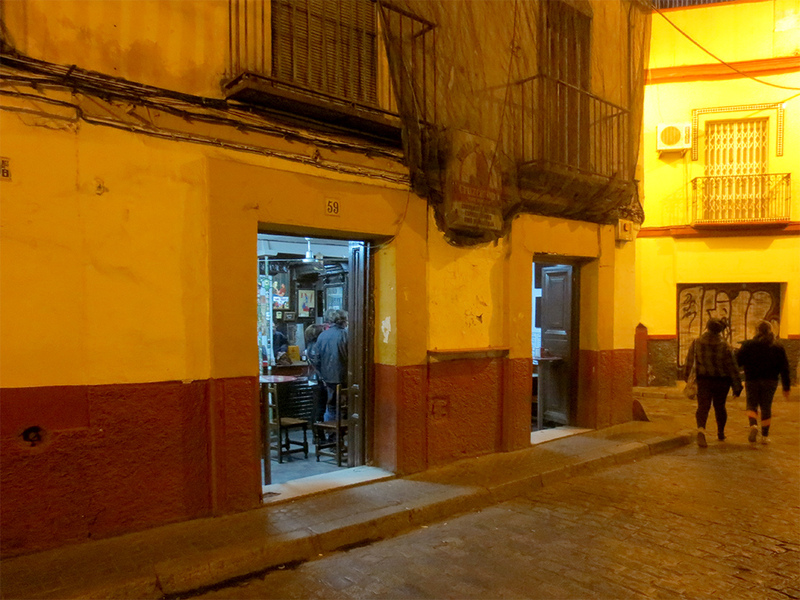 For example, Taberna Gonzalo Molina looks pretty old school and we’ve not been brave enough to enter with our barely rudimentary Spanish. 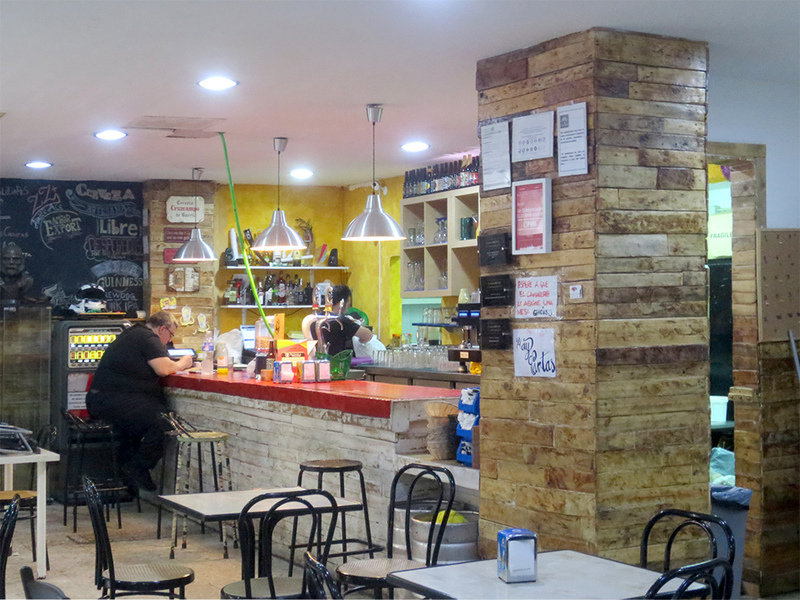 Café Bar Mega is a more approachable little hole-in-the-wall down our street. They make “Americana” food, namely burgers, fries and BBQ. 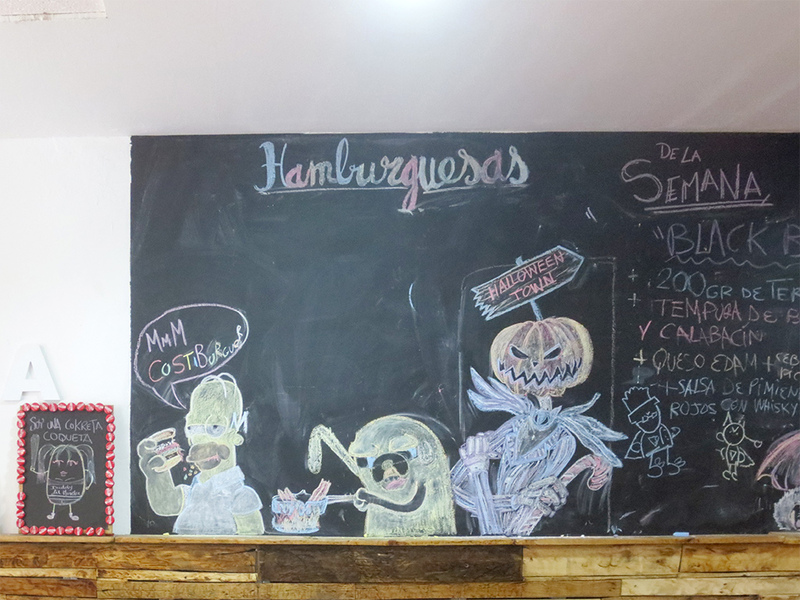 The place isn’t much to look at but the burgers are huge and tasty, and the staff are friendly. On the other hand, some establishments seem brand new, run by younger people with a trendy and modern vibe that wouldn’t be out of place in Toronto, London or New York. 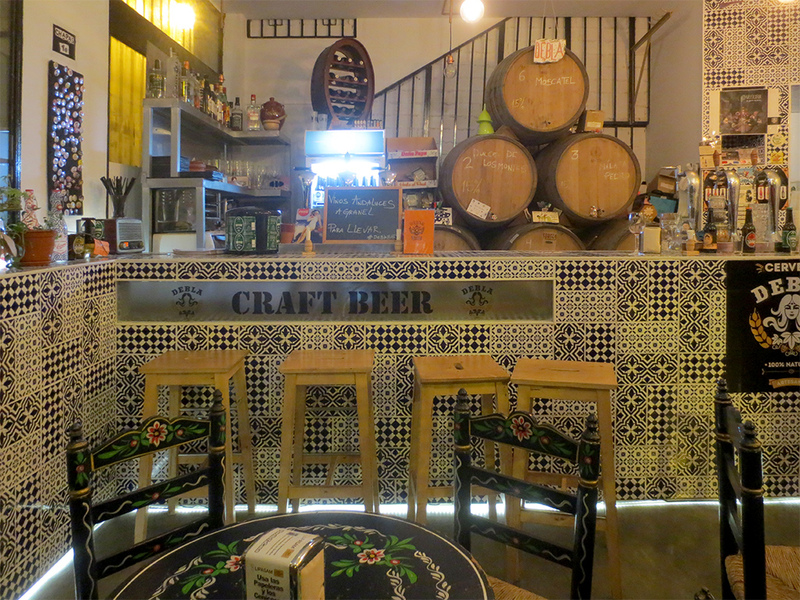 One of these is La Barrica de Debla, a little craft beer bar that sells several of its own brews along with a small selection of international European beers. 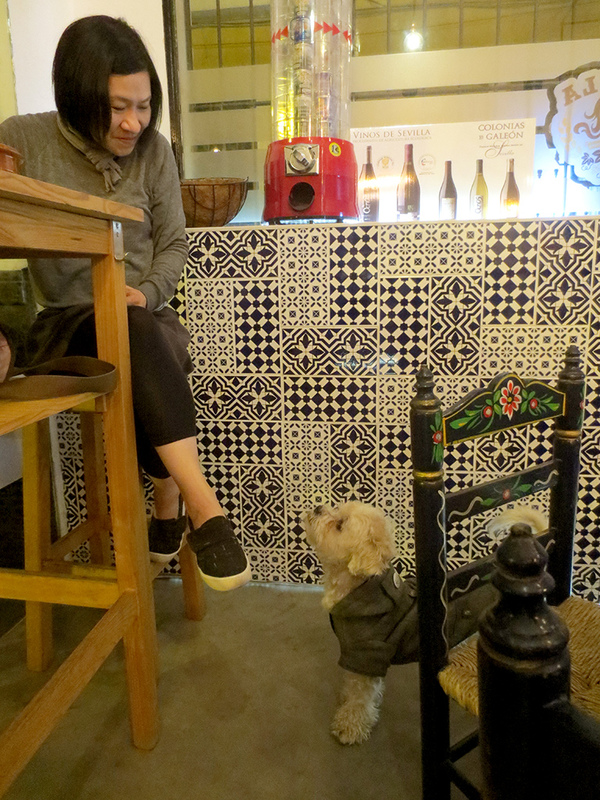 The bartender is personable (though does not speak English) and her small dog wanders in and out, begging for snacks from customers. Nothing from us, though — even Spanish dogs shouldn’t eat patatas fritas! A few blocks away, Bottega Italia is the closest thing to a coffee shop like the ones I frequent in Toronto. 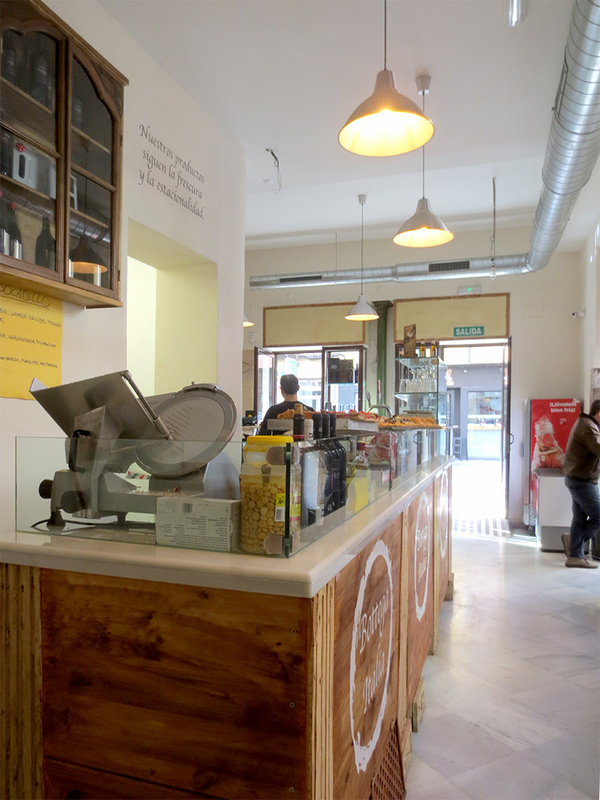 It’s one of the few counter service places we’ve found, and is run by Italians who serve delicious coffees (including Americanos) and pastries baked on the premises. They also sell pizza by the slice and small sandwiches that we’ve yet to try. 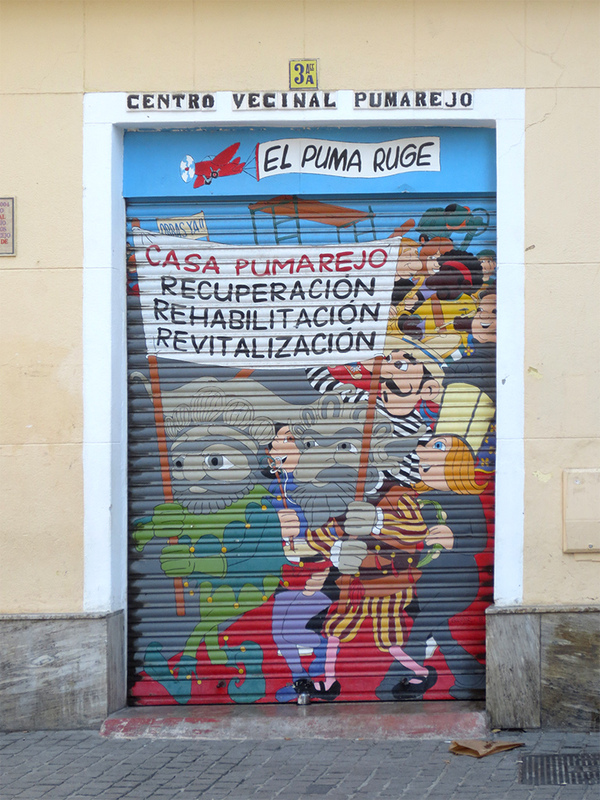 A place called the Centro Vecinal Pumarejo seems to be something of a community centre, located on a square usually populated by the locals and their kids in the evenings. We occassionally see well-attended community meetings in progress in the center. The building that houses it — a former palace that degraded into a tenement — is in the process of being refurbished. 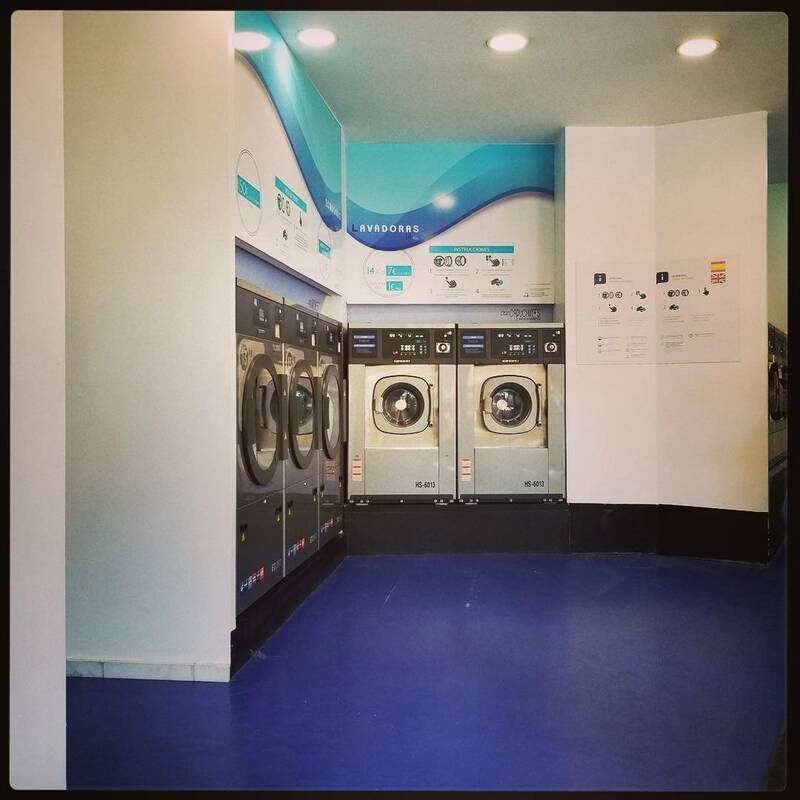 Last week we found the fantastic Auto Clean Laundry Capuchins laundromat just outside the city walls. It has two floors of sparkling new machines inside a small complex that also contains a gas station, a car wash, and a bar, all staffed by people wearing matching orange and black uniforms. 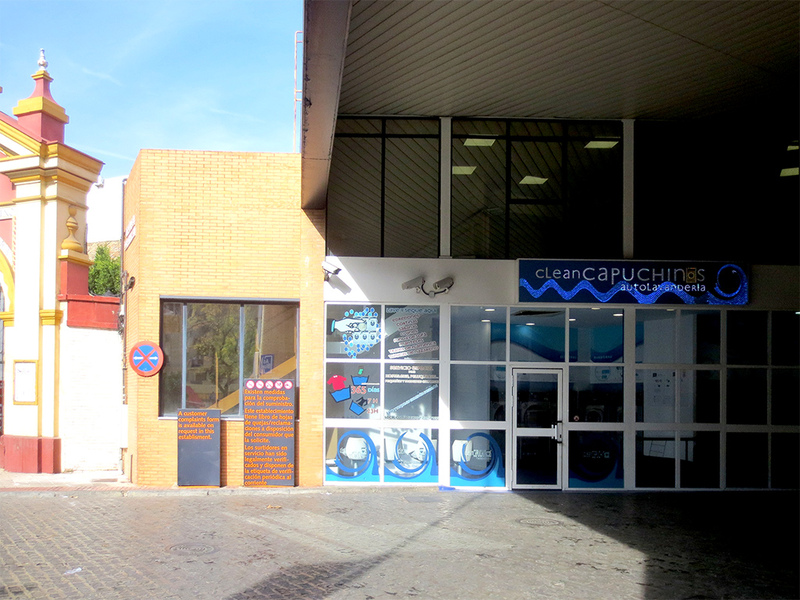 In classic Seville style, this modern facility is adjoined to (and named after) the Convent of the Capuchins founded in 1627. 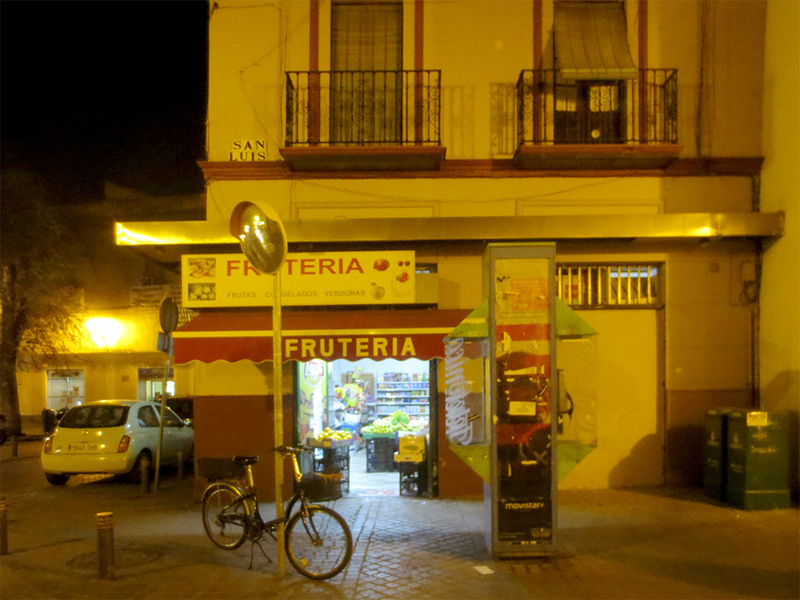 We frequent this little fruteria quite often to buy water and the occassional vegetable between visits to our larger supermarket. Almost all the fruterias throughout the core are owned and operated by Asian immigrants, which is noticeable in a city that is not nearly as multicultural as we are used to back home. Over on Calle Feria we stumbled across the Mercadillo del Jueves (“The Thursday Market) on our first week here. 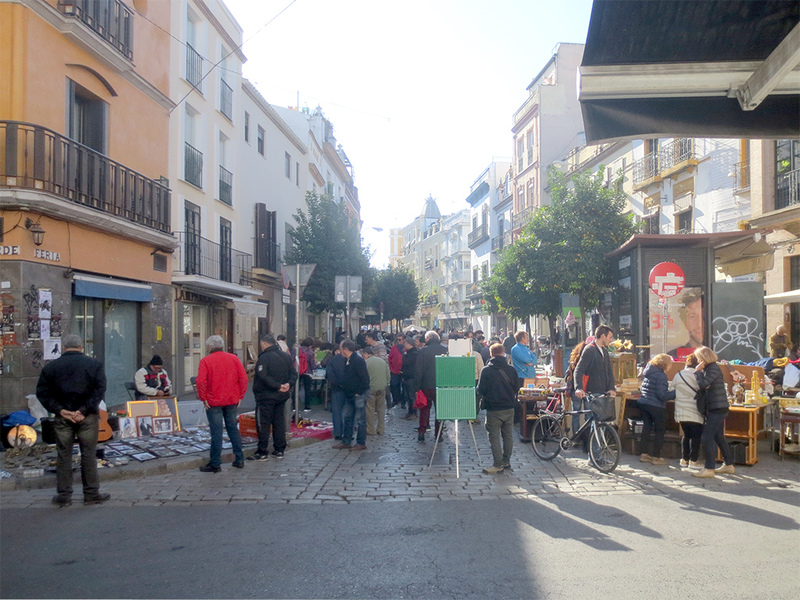 Every Thursday the streets near the permanent Feria Market are closed to traffic and filled with vendors selling every imaginable unnecessary item. 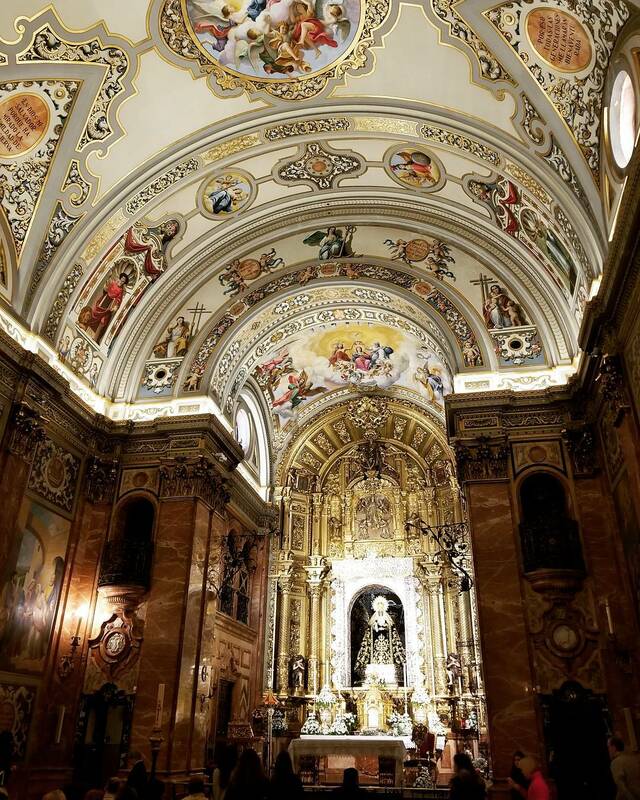 If you urgently require religious knick-knacks, soccer collectibles or old paintings in hideous frames, this is the place to come.